Rosetta probe captured odd shape on the surface of Comet 67P? A close-up NavCam image taken on 15 May 2016, when Rosetta was 9.88 km from the nucleus of Comet 67P/Churyumov-Gerasimenko, shows a strange looking object on a flat region on the comet. Credits: ESA/Rosetta/NAVCAM – CC BY-SA IGO 3.0. 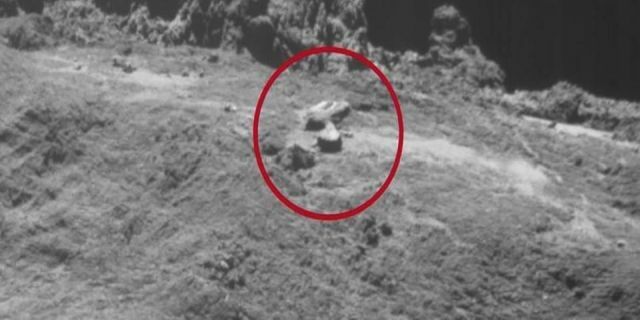 Maybe the object is just a rock or a shadow cast by bumps in the terrain, however, according to UFOvni2012 it is not a rock but a spacecraft with antennas standing on the surface of the comet. See video for more details about the alleged spacecraft. True shape of Black Knight satellite which orbits around the Earth revealed! Mega huge artificial structure on the moon - the tower / shard? TR-3B Or Alien Craft Found Abandoned On Moon's Surface? Old Soviet Luna-13 Mission Reveals Alien Artifacts On The Moon? Lake on Mars - NASA's picture from 2011 shows lake?